Mock trial can best be described as an educational opportunity for undergraduate students to take part in a simulated court trial. Every year the American Mock Trial Association produces a fictional Criminal or Civil case that students analyze and then try against other competing schools. The students who compete are tasked to perform Pre-Trial Matters, an Opening Statement, Direct Examinations, Cross-Examinations, Closing Arguments, and Witness Roles. Once prepared with their material our students will join 600+ teams and 5,300+ students and compete at Invitational Tournaments, a Regional Tournament, an Opening Round Championship Tournament, and finally a National Championship Tournament. 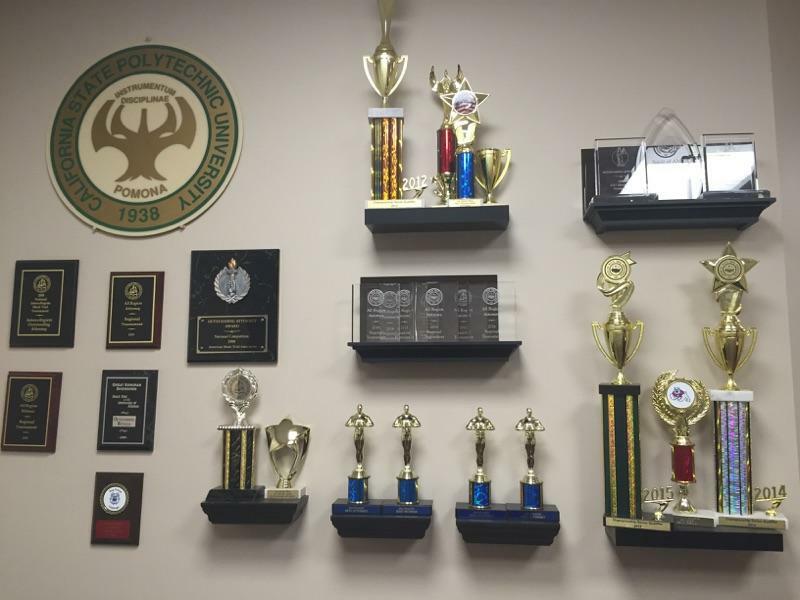 The ultimate goal is to obtain the the American Mock Trial Association National Trophy. One of the most amazing things about the Cal Poly Pomona Mock Trial Program is its ability to not just give students an opportunity to see trial advocacy, but also give them a chance to try trial advocacy! Students who are interested in learning how to advocate as they would in American courtrooms are provided opportunities to conduct Opening Statements, Closing Arguments, Objections, Direct Examinations, and Cross Examinations. Further, students are asked to analyze complex cases that intensely focuses on building case theories, applying law correctly, and being challenged by an opposing counsel who will test the arguments of the student. Our program doesn't just cherish the Art of Advocacy but also celebrates the Art of Presenting! Everything we do in mock trial is to be presented in front of a panel of judges. Rhetoric, Clarity, Resonance, Communication, and Entertainment are always to be considered and enhanced. Mock Trial is not a program that just helps the future advocates, it is helps the future presenters. During practices and their competitions students are always encouraged to be critical about how they think since much of mock trial deals with how well one understands complicated information. Students are not only encouraged to be critical, but also must become accustom to handling critical decision making in situations that are competitively evaluated. "AMTA draws many of the best and brightest young minds in the country. AMTA alums include Rhodes Scholars, Supreme Court clerks, and recipients of almost any other honor you could imagine. Given the high caliber of AMTA competitions, building a successful program is a source of great pride for many school administrations. And, as a remarkable learning experience with a strong competitive flavor, it is an exhilarating opportunity for all participants." See us against the feared and talented national championship program of UCLA! We also have tons of fun!!! !